Soon to be a major motion picture, written and directed by Aaron Sorkin and starring Jessica Chastain, Idris Elba, Kevin Costner, and Michael Cera—the true story of "Hollywood's poker princess" who gambled everything, won big, then lost it all. 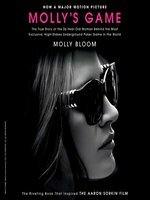 Molly Bloom reveals how she built one of the most exclusive, high-stakes underground poker games in the world—an insider's story of excess and danger, glamour and greed. Hundreds of millions of dollars were won and lost at her table. Molly's game became the game for those in the know—celebrities, business moguls, and millionaires. Molly staged her games in palatial suites with beautiful views and exquisite amenities. She flew privately, dined at exclusive restaurants, hobnobbed with the heads of Hollywood studios, was courted by handsome leading men, and was privy to the world's most delicious gossip, until it all came crashing down around her.